Be the first to share your favorite memory, photo or story of Joby. This memorial page is dedicated for family, friends and future generations to celebrate the life of their loved one. Joby Earl Hart, 75, of Princeton, KY, passed away at his home on January 31, 2019. Joby was born on December 14, 1943. Joby is survived by his daughter, Jennifer Earline Hart son-in-law; Barry Pavicic, of Bloomington, Indiana. He was preceded in death by his two sons, Dickie Joe and Jeffery Earl. 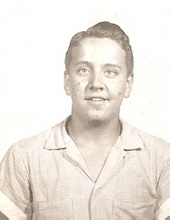 His brothers Harlan, Garland and Pete Hart, along with his sister Louise (Maxey) preceded him in death many years ago. Joby leaves behind many nieces and nephews. After 42 years of railroading, Joby retired from the P&L Railroad in 2004. He started with the Illinois Central when he was 17 years old. His happiest times were spent watching, playing or talking about baseball. Joby lived the last few years at Franklin Apartments in Princeton, where he made many friends. Especially dear to him were Cordie Gray and Hilda Cash. These ladies made it possible for him to stay in his home until the end of his life and are owed a debt of gratitude. Thanks to Susie Hinkle, Lisa and Kevin Sisk, Missy Dunning and Renee and Gayle Coleman for all the visits, food and errand-running. A special thanks to Pennyrile Hospice for their work in ensuring Joby was able to stay at home and end his life with grace. Visitation will be held at Morgan’s Funeral Home, 301 W. Washington St., Princeton, KY 42445 on Saturday, February 9th, from 10:30 until 12:15 with a memorial service at 12:15. No graveside services will be held. In lieu of flowers, the family has requested memorial donations be made to the Hart and Home Scholarship, Habitat for Humanity of Monroe County, 213 East Kirkwood, Bloomington IN 47401, or St. Jude Children’s Research Hospital, memorial ID #11549139, PO Box 1893, Memphis, TN 38101-9950. To send flowers or a remembrance gift to the family of Joby Hart, please visit our Tribute Store. "Email Address" would like to share the life celebration of Joby Hart. Click on the "link" to go to share a favorite memory or leave a condolence message for the family.